For the two-phased structure in steel, see pearlite. Perlite softens when it reaches temperatures of 850–900 °C (1,560–1,650 °F). Water trapped in the structure of the material vaporises and escapes, and this causes the expansion of the material to 7–16 times its original volume. The expanded material is a brilliant white, due to the reflectivity of the trapped bubbles. Unexpanded ("raw") perlite has a bulk density around 1100 kg/m3 (1.1 g/cm3), while typical expanded perlite has a bulk density of about 30–150 kg/m3 (0.03–0.150 g/cm3). Perlite mine in Owens Valley, California. Perlite is a non-renewable resource. The world reserves of perlite are estimated at 700 million tonnes. In 2011, 1.7 million tonnes were produced, mostly by Greece (500,000 t), United States (375,000 t) and Turkey (220,000 t). However, no information for China – a leading producer – was available. As of 2003[update], Greece was a leader in processed perlite production; however, estimates of perlite production from the report USGS Mineral Commodity Summaries 2013 indicate that the U.S. may have overtaken Greece. Because of its low density and relatively low price (about US$50 per tonne of unexpanded perlite), many commercial applications for perlite have developed. In the construction and manufacturing fields, it is used in lightweight plasters, concrete and mortar (masonry), insulation and ceiling tiles. It may also be used to build composite materials that are sandwich-structured or to create syntactic foam. In horticulture, perlite can be used as a soil amendment or alone as a medium for hydroponics or for starting cuttings. When used as an amendment it has high permeability / low water retention and helps prevent soil compaction. Perlite is an excellent filtration aid and is used extensively as an alternative to diatomaceous earth. The popularity of perlite usage as a filter medium is growing considerably worldwide. Perlite filters are fairly commonplace in filtering beer before it is bottled. Small quantities of perlite are also used in foundries, cryogenic insulation, and in ceramics as a clay additive. It is also used by the explosives industry. Due to thermal and mechanical stability, non-toxicity, and high resistance against microbial attacks and organic solvents, perlite is widely used in biotechnological applications. Perlite was found to be an excellent support for immobilization of biocatalysts such as enzymes for bioremediation and sensing applications. People can be exposed to perlite in the workplace by breathing in dust, skin contact, and eye contact. The Occupational Safety and Health Administration (OSHA) has set the legal limit (permissible exposure limit) for perlite exposure in the workplace as 15 mg/m3 total exposure and 5 mg/m3 respiratory exposure over an 8-hour workday. The National Institute for Occupational Safety and Health (NIOSH) has set a recommended exposure limit (REL) of 10 mg/m3 total exposure and 5 mg/m3 respiratory exposure over an 8-hour workday. ^ Maxim, L. Daniel; Niebo, Ron; McConnell, Ernest E. (2014-04-01). "Perlite toxicology and epidemiology – a review". Inhalation Toxicology. 26 (5): 259–270. doi:10.3109/08958378.2014.881940. ISSN 0895-8378. PMC 4002636. PMID 24601903. ^ Md Arifuzzaman and H. S. Kim, "Prediction and evaluation of density and volume fractions for the novel perlite composite affected by internal structure formation", Construction and Building Materials, Vol 141, 2017, 201–215. ^ Md Arifuzzaman and H. S. Kim, Novel flexural behaviour of sandwich structures made of perlite foam/sodium silicate core and paper skin, Construction and Building Materials, Construction and Building Materials, Vol 148 2017, pp 321–333. ^ Dipendra Shastri and H. S. Kim, “A new consolidation process for expanded perlite particles”, Construction and Building Materials, Vol 60, June, 2014, pp.1–7. ^ "ISU Extension News Release". iastate.edu. Archived from the original on 2004-03-23. ^ Torabi, Seyed-Fakhreddin; Khajeh, Khosro; Ghasempur, Salehe; Ghaemi, Nasser; Siadat, Seyed-Omid Ranaei (2007-08-31). "Covalent attachment of cholesterol oxidase and horseradish peroxidase on perlite through silanization: Activity, stability and co-immobilization". Journal of Biotechnology. 131 (2): 111–120. doi:10.1016/j.jbiotec.2007.04.015. PMID 17658643. ^ "PERLITE : (Data in thousand metric tons unless otherwise noted)" (PDF). Minerals.usgs.gov. Retrieved 22 October 2017. ^ "Perlite" (PDF). U.S. Geological Survey Mineral Commodity Summaries: 122–123. January 2006. ^ "CDC – NIOSH Pocket Guide to Chemical Hazards – Perlite". www.cdc.gov. Retrieved 2015-11-27. 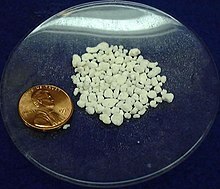 Wikimedia Commons has media related to Perlite. "That Wonderful Volcanic Popcorn." Popular Mechanics, December 1954, p. 136.